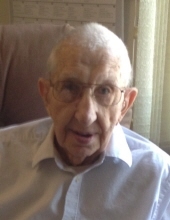 Mr. Norbert Hubing, of Belgium, formerly of Tuscon, AZ, passed away at Cedar Grove Gardens where he had resided since August. He was 94 years old. Norbert was born in the Town of Belgium on April 8, 1922, son of John and Sylvina Rach Hubing. He attended local schools before enlisting in the US Army and proudly serving his country during World War II. While his ship was on the way to North Africa, it was bombed and Norbert was listed as MIA. He was awarded a Purple Heart following his rescue. On August 7, 1948 Norbert was united in marriage with Esther Decker at St. Mary's Catholic Church in Port Washington. The couple settled in Port Washington. Mr. Hubing worked at Allen Edmonds Shoe Company, Bolens and Simplicity before they moved to Arizona in 1956. Esther preceded him in death in 2012. Mr. Hubing moved back to the Belgium area and lived with his sister Kathleen Bares before recently going to Cedar Grove Gardens. Norbert was a member of the VFW while in Arizona, and did extensive volunteer work with the St. Vincent DePaul Society. He enjoyed playing slots and a good game of sheepshead or cribbage. Recently, Sharon S. Richardson Hospice had a pinning ceremony to recognize Norbert’s time served in the US Army. Mr. Hubing is survived by his three sisters: Gert Fieber of Port Washington, Kathleen Bares and Mary Bares, both of Belgium, brother Jerry (Arleen) Hubing, also of Belgium and sister-in-law Sandy Hubing of Belgium. He is further survived by numerous nieces and nephews, other relatives and dear friends - among them Linda Watry (niece) and Daniel Watry (great-nephew), who helped Norbert in the last few years. He is preceded in death by six brothers: Emil, Donald, Robert, John Jr., Joseph and Melvin Hubing, and three sisters: Agnes Bahr, Regina Augustine and Genrose Brabender. Funeral Services will be held at 7PM on Monday, October 10th at the Eernisse Funeral Home in Belgium (171 N. Royal Ave.). Father Jim Ernster will officiate. He will be laid to rest the following day in St. Nicholas Cemetery, Town of Belgium with Military Honors. The family will receive visitors Monday evening at the Eernisse Funeral Home from 5-7PM . Memorials are suggested in lieu of flowers. Online condolences may be left at www.eernissefuneralhome.com . The family wishes to thank the staff at Cedar Grove Gardens and Sharon S. Richardson Hospice for the loving, wonderful care that they gave Norbert. To send flowers or a remembrance gift to the family of Norbert H. Hubing, please visit our Tribute Store. "Email Address" would like to share the life celebration of Norbert H. Hubing. Click on the "link" to go to share a favorite memory or leave a condolence message for the family.